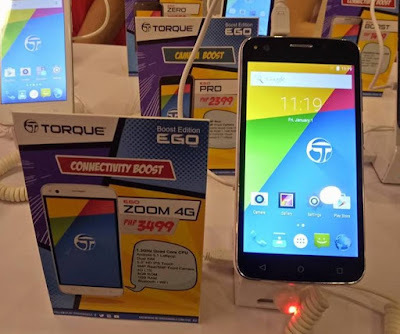 Among the total of 15 devices launched earlier by Torque Mobile, the most interesting and the one that stands out is the Torque Mobile EGO Zoom 4G. The Torque Mobile EGO Zoom 4G sports a 5-inch HD IPS display powered by 1.3GHz quad core processor coupled with 1GB of RAM and 8GB of expandable storage. The chipset is still unknown, but given the fact that it has LTE connectivity, we bet it will be the MediaTek MT6735. In terms of photography capability, it packs an 8MP auto focus sensor on its back and a 5MP with LED flash is assigned to take care of selfie shots. Other known specs are dual SIM, WiFi, Bluetooth and it runs on Android Lollipop. The best part is, it will only cost you Php3,499 to own it, making it one of the most affordable handset to have 4G/LTE.